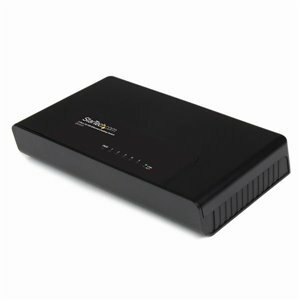 Connect and network up to 5 Ethernet devices through a single 10/100 Mbps desktop switch. The DS51072 5-Port Ethernet Network Switch enables up to 5 users to share files and devices (e.g. printers, scanners) over a LAN connection, by expanding an existing network's capacity with additional ports.Compatible with both 10Base-T (10 Mbps) and 100Base-TX (100Mbps) networks, this Fast Ethernet switch can automatically detect the type of network (auto- negotiation) as well as the type of cable (auto MDIX) and configure itself, making for an easy to install, Plug-and-Play networking solution.